Whether you need a little inspiration or a completely new life direction, Your Illustrated Guide to Becoming One with the Universe provides you with the necessary push to find your true path – and a whimsical adventure to enjoy on the way there. My mind feels full to bursting – chaotic, even – most of the time. 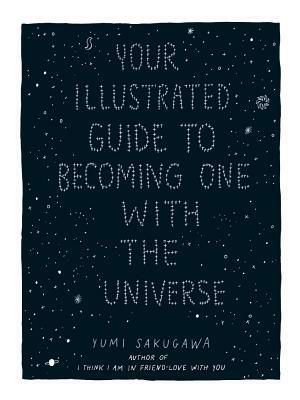 Your Illustrated Guide to Becoming One With The Universe helped calm it. A tranquil combination of graphic novel + self-help, this book is like nothing else I’ve read. Through black and white illustrations, Yumi Sakugawa demonstrates how to come to terms with both the world and yourself. Although the latter is far smaller, it often feels just the opposite. It’s HARD to be at peace with yourself… it’s debatable whether any of us ever completely are. But this book certainly puts us a step closer. With instructions ranging from the literal and straightforward (“pay attention and listen”) to the metaphorical (“set yourself on fire”), Your Illustrated Guide to Becoming One With The Universe teaches you basic breathing and destressing exercises. It’s only 160 pages long, but is by no means a quick read. Even that mouthful of a title forces you to slow down and take your time! This book feels like a trusted friend. The only one who knows all your problems and secrets. Who maybe even knows you better than you know yourself. Definitely one to revisit + ponder. Reminiscent of Shel Silverstein, The Sad Ghost Club, and Everyone’s A Aliebn When Ur A Aliebn Too. Yumi Sakugawa is surely a talent to keep an eye on. This entry was posted in Books and Reading!, Nevillegirl's Adventures!, Non-Neville Posts, Uncategorized and tagged art, book reviews, books, deep thoughts, graphic novel, meditation, mental health, metaphor, reading, reviews, self care, self-help, universe, Your Illustrated Guide To Becoming One With The Universe, Yumi Sakugawa. Bookmark the permalink.